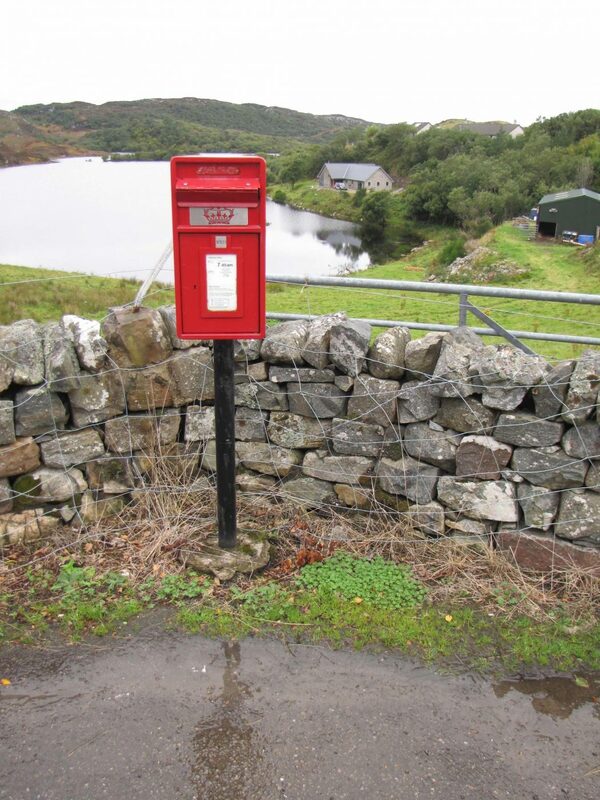 I was posting a letter at Drumbeg on 14th September 2018 when I spotted, as you do, an unfamiliar plant beside the post-box, which is opposite the Stores (NC1232). 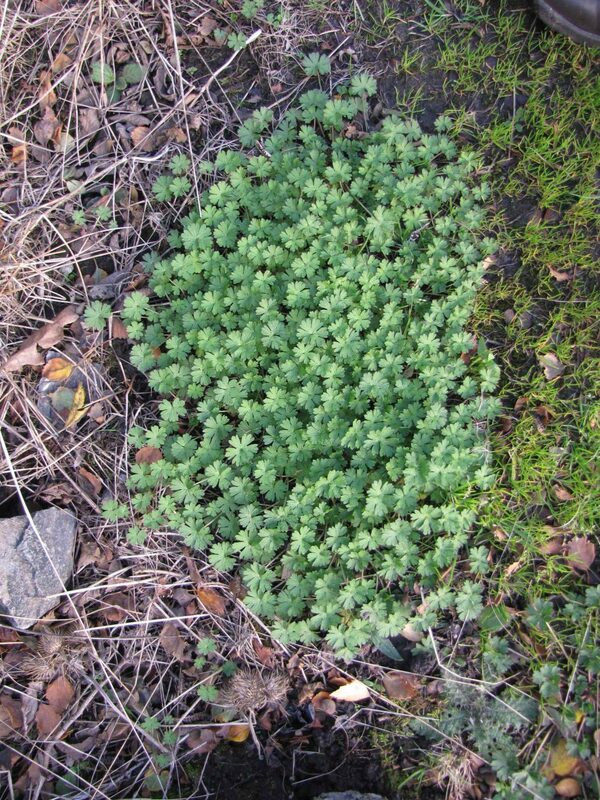 There was a substantial patch of it, flat to the ground, with softly hairy long-stalked leaves up to 3cm in diameter, rounded in outline but cut, quite deeply, into seven segments. It was obviously a perennial, but there were no flowers, so a challenge to identify. A likely candidate was one of the crane’s-bills Geranium spp., but which? Four species are mentioned in the Flora of Assynt, but three did not fit. 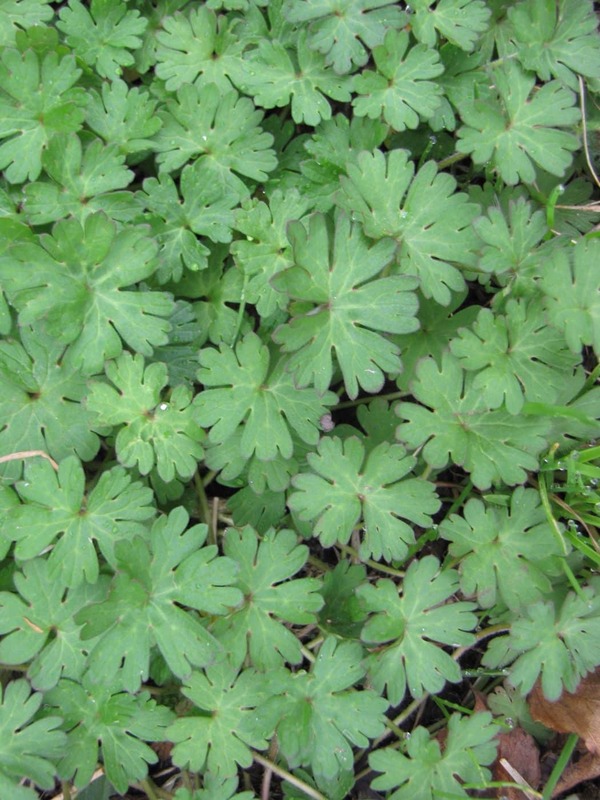 They were a garden escape, shining crane’s-bill G. lucidum, which has glabrous (hairless) leaves, and two others, herb-robert G. robertianum and cut-leaved crane’s-bill G. dissectum, which have very deeply-cut leaves. That left dove’s-foot crane’s-bill G. molle, a small annual or short-lived perennial, which grows on the tops of the walls of a ruin in Nedd. The shape of the leaves was a fair fit for this species, but something about its habit worried me. I took a couple of leaves and had a close look at them under a low-power microscope, comparing them with ones from a Nedd specimen of G. molle. 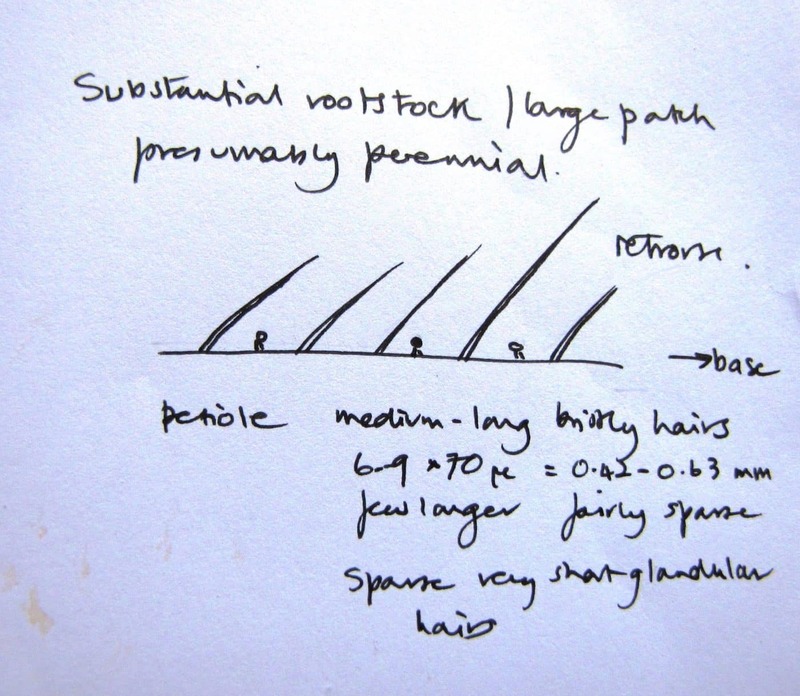 The pattern of hairs on the petioles (leaf stalks) was quite different (see sketches). The Drumbeg specimen had large, rather bristly, hairs pointing back down the petioles, arising from a dense carpet of tiny hairs, many with glistening glands. The Nedd specimens of G. molle had finer upright hairs of a great variety of lengths, many of the shorter ones also with glands. 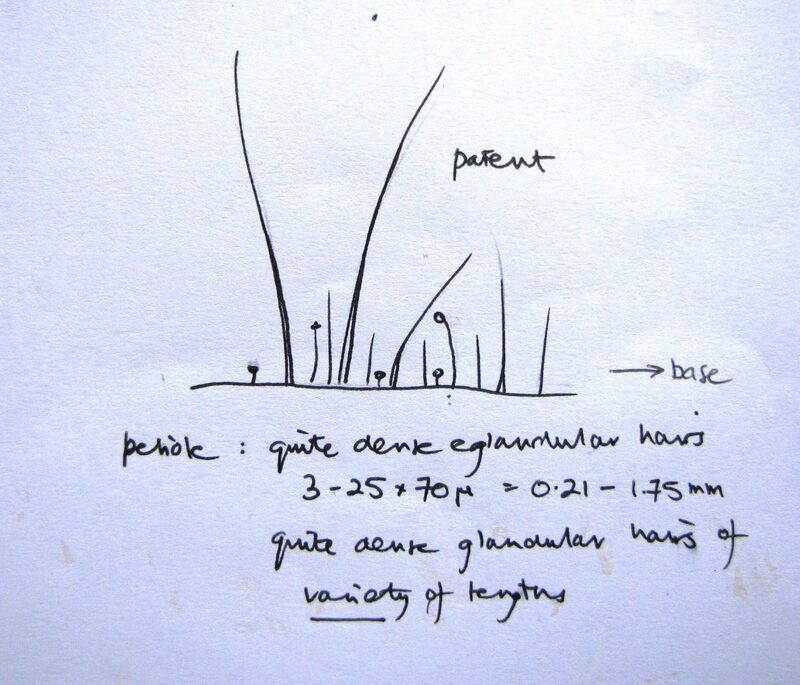 I then consulted The Vegetative Key to British Plants (Poland and Clements 2009), which is indispensable for identifying plants lacking flowers, and was directed to a likely candidate, hedgerow crane’s-bill G. pyrenaicum. I clinched the identification with a specimen from the garden of a friend in Inverness, where it was introduced and thrives. Hedgerow crane’s-bill is described as ‘possibly native’ and ‘locally frequent in much of the British Isles but absent from much of [the] North and West and introduced there’. It has pinkish-purple flowers about 15-20mm in diameter. At this point bells began to ring and I eventually located notes from 23rdOctober 2017, when a small group of us found a single specimen on waste ground beside the road near Newton (NC2331), the first record from Assynt. Wendy Glover does not have it in her garden at the Stores, so we may never know how it arrived in Drumbeg. It has the look of a survivor, and I shall watch its future performance with interest.